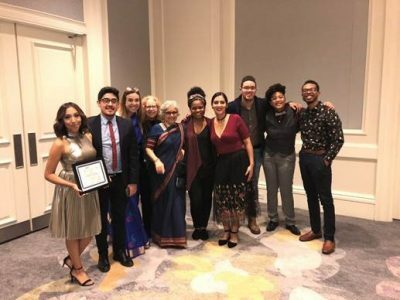 Joseline Tlacomulco (19’), double major in Political Science and Human Rights, was awarded the “Undergraduate Social Action Award” given by Sociologist for Women in Society (SWS), a national nonprofit professional organization dedicated to efforts related to feminist action, including, promoting social justice through local, national, and international activism. This recognition is awarded to a student making a substantial contribution to improving the lives of women in society through their activism. Following the presidential inauguration of 2016, Joseline spearheaded many efforts on campus that facilitated open and much needed discussions about how immigration reform and other laws would affect UConn students. Followed by a campus-wide march, Joseline attended various meetings to ensure that undocumented students would be safe at UConn. These efforts resulted in UConn becoming a sanctuary campus. In addition to her grassroots work, Joseline is committed to student growth on our campus and is a frequent guest lecture for many departments. Joseline’s lectures are incredibly complex and critical, and she offers students the opportunity to think through issues of diversity, as well as access to recourses. Because of this work, Joseline has become a mentor to many undergraduate students. Malachi Bridges, an undergraduate student at UConn wrote the following testimony for the nomination packet, “Joseline is an activist that is always willing to learn, work, help and teach. 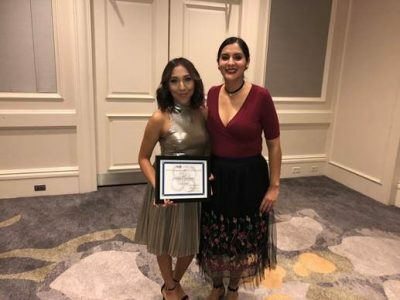 Among all these roles, she allocates the same 110% effort.” Another student, Laura Bedoya stated, “I admire Joseline’s fearlessness and ability to advocate for herself and many others. She inspires me stand firm in my beliefs.” It is clear that Joseline is a gifted speaker and is able to use her lived experiences to communicate issues often left out of curriculum and ones that resemble the diverse problems students of color on our university face today. I’ve known Joseline for 3 years now, and she has profoundly changed my life. My interactions with her in my classroom, grassroots events, and other activities persuaded me to nominate her. When I saw the call for the award, I immediately thought of her and I felt in my heart that there was no one else more deserving of this award than her. At the award reception held on Saturday January 27, 2018 in Atlanta, Georgia Joseline gave a moving speech that was received with a standing ovation and her recognition was referred to as the “highlight of the event.” Her story and efforts are a legacy that will live on in the history of our nation. During this contentious and political divisive time activists like Joseline give us hope, faith, and courage.